France and India appear to be on the path toward forging a unique strategic partnership in the Indian Ocean and Pacific regions, mainly to act as a bulwark against the rapid expansion of Chinese influence, a development that has bothered both countries for quite some time. 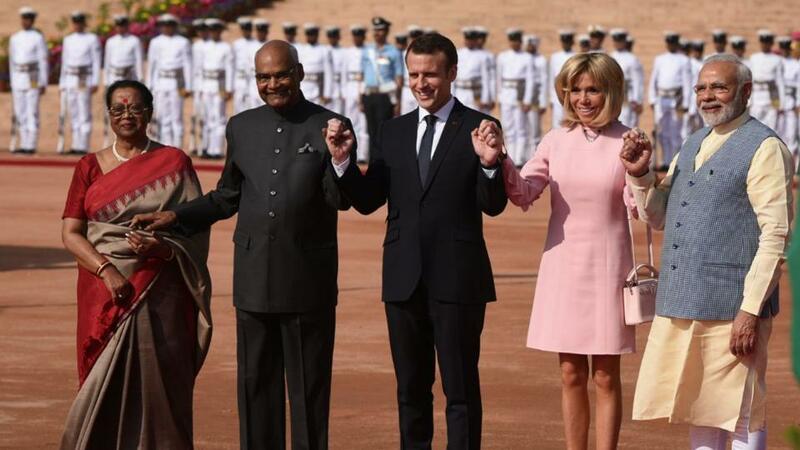 French President Emmanuel Macron, while on a state visit to India at the weekend, underlined in an unusually candid statement the growing geostrategic ties between the two countries. He said France and India had decided to give unprecedented strength to their strategic partnership, which was now 20 years old. “India is worried about the growing Chinese hegemony in the Indian Ocean and the Pacific Ocean regions. France is a major maritime power in both regions. So it is with this strength that we have decided to join hands with the Indian government to assure the stability and security of India and the Indian Ocean region,” Macron said in a speech in New Delhi. Macron arrived in New Delhi on Friday 9th, for a four-day visit to India, his first since his historic electoral triumph last May. This was also the second meeting between Macron and Indian Prime Minister Narendra Modi. Over the last few years, the increasing Chinese presence, including access to key ports and military bases throughout the Indian and Pacific Oceans, has many nations —India and France among them — worried. It is in this context that France and India began discussions on sharing their facilities and mounting a common strategy to contain the Chinese, as well as protect their own interests. As one of the world’s leading maritime powers, France has a number of bases in the region, including in its overseas territories, Reunion Island in the Indian Ocean and New Caledonia in the Pacific. In addition, it also has bases at Djibouti and Mayotte, close to Madagascar. For India, the region is even more strategic as it previously enjoyed the status of being the dominant power in the Indian Ocean, Arabian Sea and Bay of Bengal. But, in the past few years, China has been gaining greater access to bases and ports in the entire region, stretching from the eastern Bay of Bengal right up to the Red Sea, in what is known as its “string of pearls” around India. This means that the signing of a defense logistics agreement between India and France during Macron’s visit becomes significant, as it will allow Indian forces to use the French bases across the entire region. For decades, France has been a key supplier of modern weapons systems to India, which is the world’s largest importer of arms, accounting for nearly 12 percent of global sales in 2017. The latest French offering is its top-of-the-line fighter jet, Rafale. India has been offered 36 Rafales to bolster its aging and dwindling air force. In addition, France is building with India six Scorpene-class submarines in Mumbai. On numerous occasions during his visit, Macron said he hoped France can become the most important strategic partner for India in Europe. From an Indian perspective, this wish can come true if the French put their money where their mouth is and help India in one of the most important areas: Developing its manufacturing capacity. This is an area where India desperately needs all the help it can get from its allies, and where France is one of the few nations with a large bouquet of offerings that could help it develop into a defense manufacturing powerhouse, not just the world’s biggest arms buyer. There are opportunities aplenty for France to position itself as a true partner. India is now set to float a fresh global tender, inviting military aviation companies to manufacture 200 fighter jets. In addition, India needs to enhance its rapidly depleting submarine fleet, which currently stands at 13 conventional vessels, against the navy’s need of 28 and the 68 currently deployed by China. France can also help in the development of an engine for the Indian-made Light Combat Aircraft, as well as in manufacturing helicopters, of which India needs over a thousand. If indeed the French get down to the basics and act as a true partner in this area, Macron’s wish can come true and France can become India’s most important strategic partner, not just in Europe, but across the world. The ball is in the French court and they have to decide to what extent they can up their game in India.